As the saying goes, “Into each life, a little rain must fall.” But, with an automatic garage door opener, you can travel from your car to your garage to your home—and back again—without feeling a single drop. Garage door openers aren’t only convenient. They protect us from the elements and keep us safe as we maneuver in and out of our garages. And that’s just for starters. At Door Pros, we can help you shut the door and never look back at the hassle of operating a manual garage door with our garage door opener installation services. 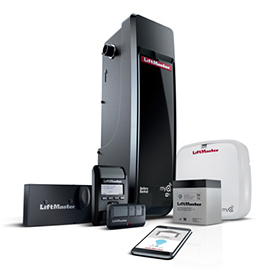 Not only do we have the talent and technical know-how to install your opener flawlessly, but we offer Clopay and LiftMaster—the ultimate in safety and convenience. With us, attaining the safety and control you want when opening or closing your garage door is smooth and trouble-free. Garage door openers hold more value than what meets the eye—or the fingertip. Let’s explore some of the key benefits. In this crazy, busy world, convenience never goes out of style. If you own a manual garage door, then opening and closing the door is a time-consuming hassle—especially if you park your vehicle or vehicles in your garage. You pull up, exit your idling car, walk over to the door, struggle to lift it up (especially if it’s heavy or doesn’t open smoothly), re-enter your car, drive inside your garage, place your vehicle in park and then stroll back over to the garage door to close it behind you. That’s a lot of work! You can eliminate this headache with an automatic garage door opener. Now, opening and closing your garage door is as easy as pushing a button. Opening and closing your garage door by hand is even worse in the blinding rain, blistering heat, frigid cold or total darkness. A garage door opener installation in your Palm Desert or Indio home allows you to move directly from your garage to your dry, comfortable home without facing Mother Nature’s wrath. With a manual garage door, it is far too easy for someone to sneak into your home unlawfully—putting your property and, more importantly, you and your loved ones at risk. Make your garage and home safer with a garage door opener installation. You see, an opener’s automatic operation isn’t only convenient. It also includes a locking mechanism to discourage intruders and strangers from trying to gain access to your property. It’s not just your home that’s more secure. It’s your family, too. We’re sure you’ve heard tales about manual garage doors crashing down on cars—and worse. Automatic garage door openers have built-in safety controls designed to stop them from crashing down unexpectedly. This minimizes the risk of property damage or personal injury. For even more protection, you can install sensors that stop the door as it’s closing if a pet or child crosses beneath it. While you can’t put a price on your security or peace of mind, electric garage door openers won’t break the bank. Though prices vary based on brand and desired features, automatic garage door openers are affordable and relatively inexpensive to install. Even more, they’re incredibly cost effective to operate. That’s because, even though they’re high-powered and technologically advanced, modern day automatic garage doors need very little power to run. This means installing an automatic garage door opener in your Coachella Valley home won’t cause a spike in your energy bills. Now that’s a win-win. Are you ready to upgrade from a manual garage door to an automatic one? Our team at Door Pros can give you a hand with our dependable garage door opener installations. From standby power systems to higher horsepower, we offer a variety of garage door openers. So, when you turn to us, our trained and experienced staff will help you choose and then flawlessly install a garage door opener that meets all of your specific needs. Plus, for whatever reason, if your opener stops working, don’t worry. We have the expertise to perform swift garage door opener repairs and replacements, too. This means, with us on your side, you can leave the manual lifestyle behind—for good. But that’s not all. From garage door replacements and installations to emergency garage door repairs, our professionals have the expertise to handle all of your garage door needs. Upgrading from a manual garage door to automatic adds convenience and safety to your everyday life. In fact, it’ll leave you wondering why you didn’t do so sooner. So, don’t wait to make the change. Give us a ring today!